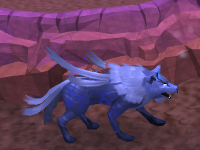 The Runespan is a separate plane from Gielinor, in which you can siphon runic energy from the creatures found within and use it to make runes from rune essence. While the wizards from the Runecrafting Guild have been observing the Runespan for quite some time, they have only recently started exploration. 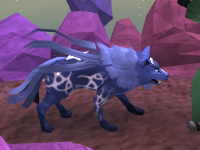 The Runespan is an excellent place to train your Runecrafting skill, providing some of the best experience in the game for it. 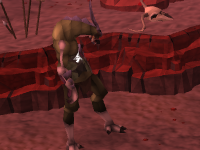 There are no requirements to use the Runespan. There are a few ways to get to the Runespan. First, and most easiest, is to use the 'Teleport' option on your Wicked Hood which will take you directly to the Runespan portal. Secondly is to travel with the Fairy Ring network using the code 'D-I-S'. 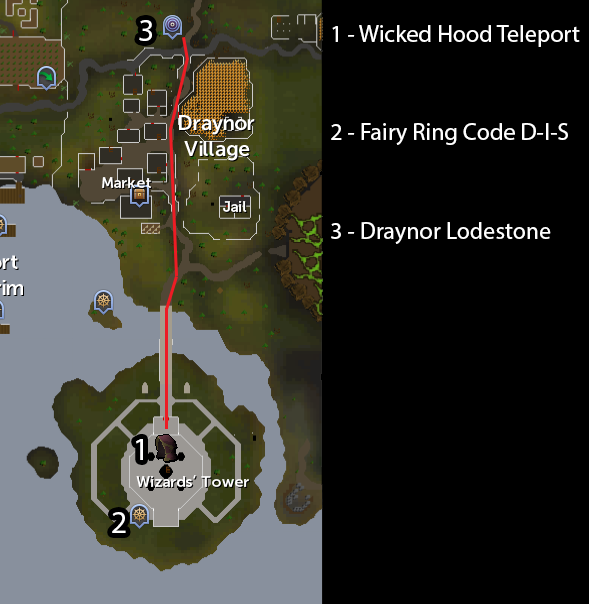 Finally you can walk south to the Wizards' Tower from the Draynor Lodestone. When you arrive at the Wizards' Tower, head up the stairs to the top floor. 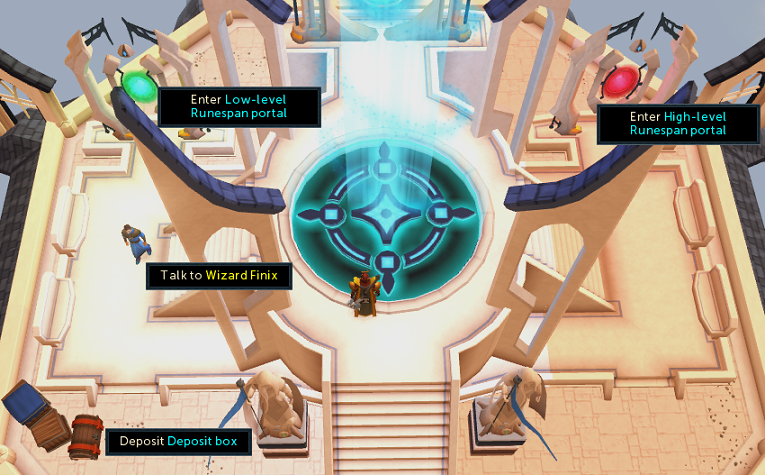 Here you will find: a low-level and high-level Runespan portal, a bank deposit box, and Wizard Finix. Since there are no items required to use the Runespan, you can deposit anything extra you are carrying into the deposit box. Furthermore, you can take anything into the Runespan except rune or pure essence - Archmage Sedrior has forbidden these. 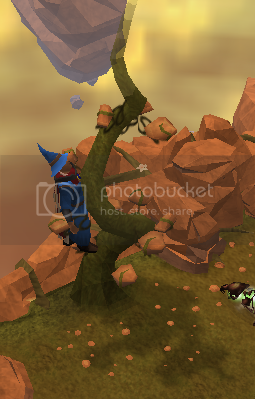 After entering the Runespan, you will find that Wizard Finix has traveled here as well. Right-clicking him will provide you with a variety of options. If you talk to him and choose the "What Can I Do Here?" option he will give you a short tutorial on the Runespan. It is highly recommended that you go ahead and take this tutorial, as it does provide you with some basic knowledge on how to use the Runespan. 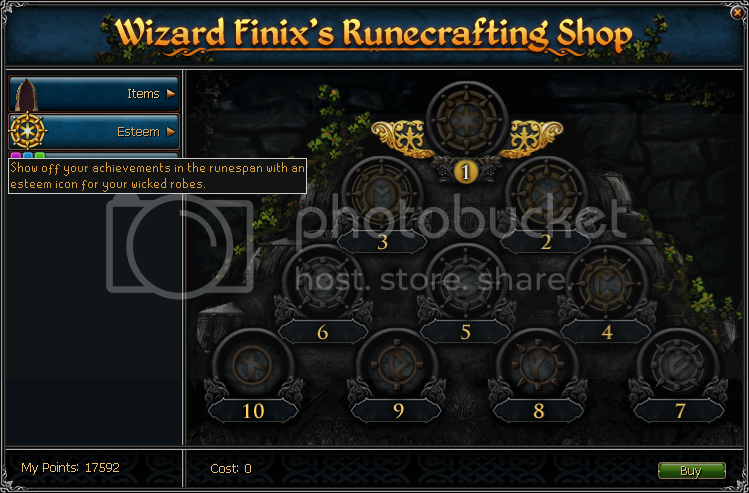 You can purchase runes from him, and he will give you 10 of each of the runes you are able to siphon for a small fee out of your reward points. 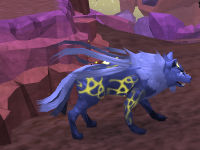 It is highly recommended you purchase these runes every time you enter the Runespan as they allow you to quickly travel across platforms without needing to siphon runes. 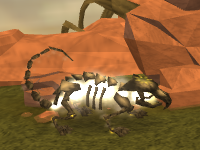 This section will show you how to use the Runespan, siphoning runes to gain experience and reward points. First of all, you are probably going to notice a few icons in the top left-hand corner of your screen. The first icon will tell you how many reward points you have. The second will tell you how many reward points you will gain when leaving the Runespan. The third icon will indicate which floor you are on. Hovering over this icon will cause a tool-tip to appear telling you the floor. The fourth icon will only show up when a Runesphere is active. 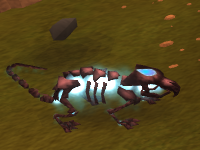 When in the Runespan, you can siphon creatures and energy nodes to gain Runecrafting experience. To be able to do so you will need some rune essence, meaning the first thing you will want to do is collect some from the Floating essence piles. You can only ever collect 25 essence this way, and if you are somewhere under 25 it will top you back up to 25. 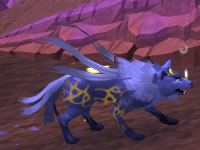 After you have your rune essence, you will want to siphon some runes out of one of the esslings wandering around. When you siphon a creature, you will turn your rune essence into runes of that creatures type. 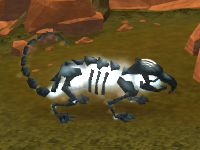 A creature only has enough runic energy to make 5 runes, then they will die and you will also gain 50 rune essence. You can also chip off a creature to gain some rune essence. Chipping away at a creature will use 10 of the required runes. 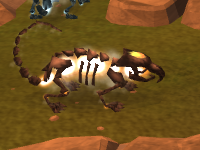 Chipping is the quickest way to gain rune essence, followed by siphoning from lower level creatures. 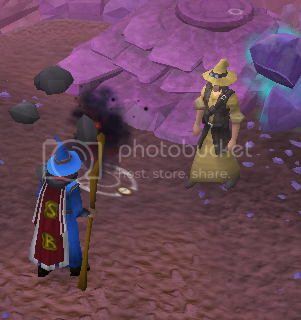 After you have siphoned or chipped away at some creatures to build up a pile of rune essence, you can use the accumulated essence to siphon off of some nodes. Siphoning off an energy node will turn your essence into runes of the nodes type, but it will not provide any rune essence after the node has been used up. Siphoning from energy nodes gives better experience than siphoning from creatures. 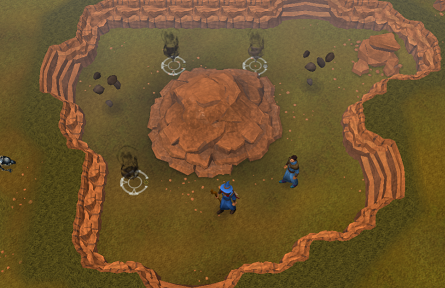 Since the Runespan is made up of several islands, to travel between them you have to use bridging points. These are indicated by platforms around the edges of the islands, and they cost runes to use. Higher leveled Runecrafters will be able to go up to the higher floors. To do so, you will need to go up the ladder found on your current floor. 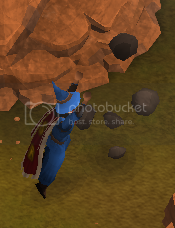 As you are collecting runes, you will notice that the number next to the backpack shaped icon will be going up. This is because when you leave the Runespan, all the runes you have gathered in will be handed in to the Runecrafting guild and you will gain reward points equal to that number. The more runes you gather, the more points you will be able to gain. For example, 10 air runes is equal to one point or 0.1 points per rune. Higher level runes are worth more points per rune. To leave the Runespan, you will need to find Wizard Finix or one of the wandering wizards and ask them to teleport you out. Alternatively, you can simply teleport out using the Lodestone system. 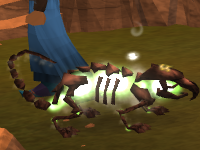 When leaving the Runespan, your accumulated runes will be converted into points (even if you teleport out). 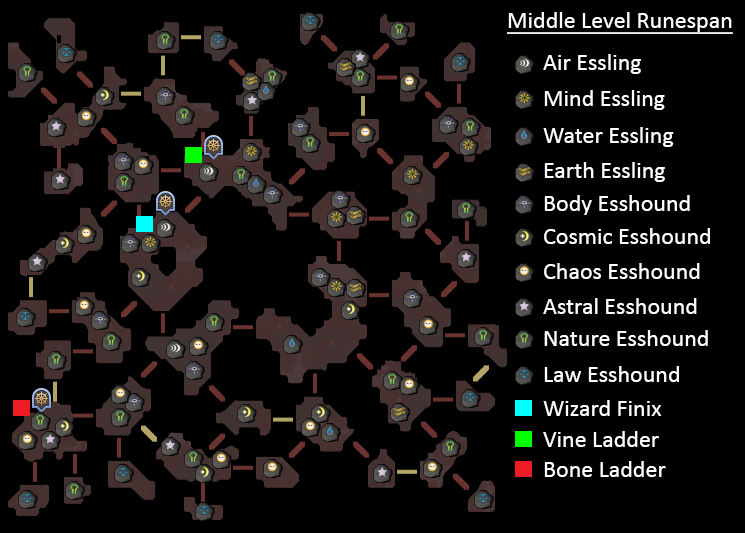 There are three floors in the Runespan, the first of which is the lower level. This floor is for beginners, and on it you will find all Esslings. 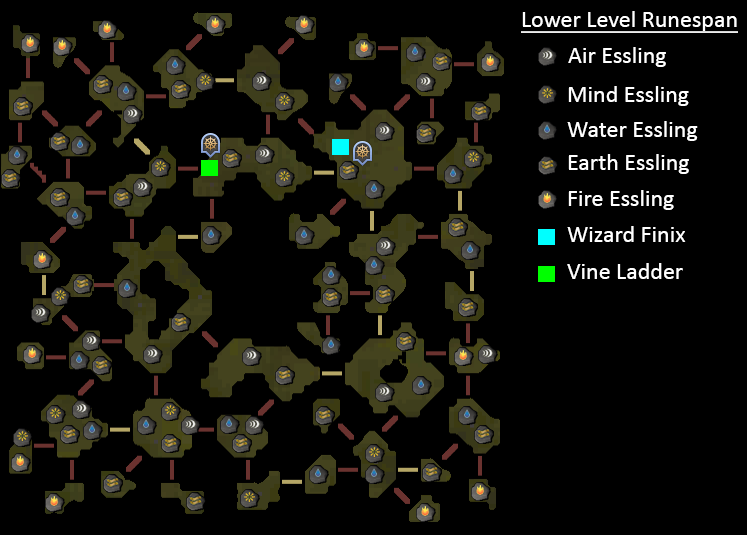 Once you've levelled up your Runecrafting to 33 you will be able to ascend the Vine Ladder and will find yourself in the middle level of the Runespan (if you're Runecrafting level is 50, you are able to use the high-level portal which will take you here). 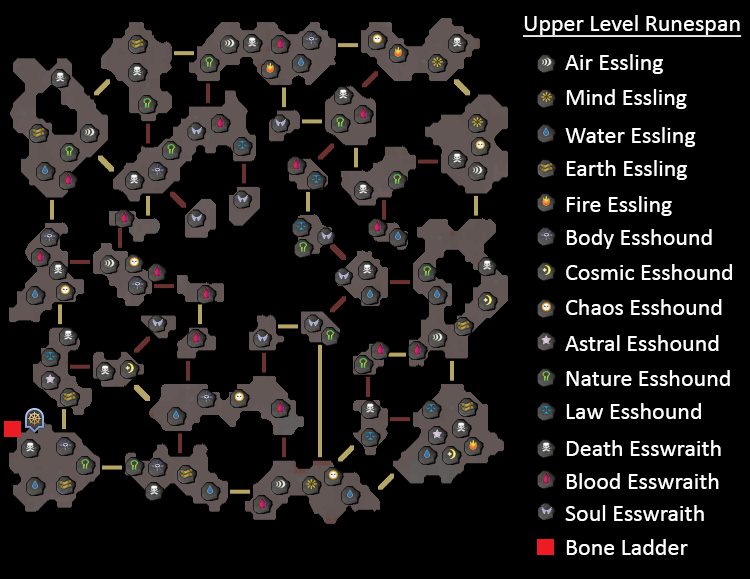 On this level you will find all Esslings (excluding the Fire Essling) and all Esshounds. 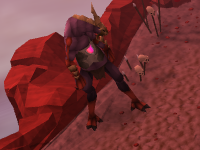 At level 66 Runecrafting you will be able to ascend the Bone Ladder to the highest level of the Runespan. Next stop, 99 Runecrafting! Here you will find all creatures. *There is a chance at failing a siphon, in which case you will receive from 0 to 2xp. You only need one of each of the required runes in order to pass. If a platform has an 'Elemental' rune requirement, then you can either use an earth, air, fire, or water rune; whichever you have most. 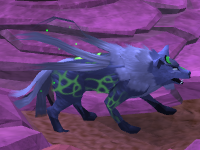 There are a couple of distractions and diversions which are unique to the Runespan. They are the Yellow Wizard and the Runesphere. 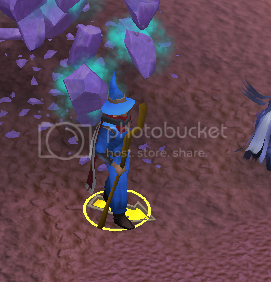 There are a few wandering wizards who teleport about the Runespan. One of these is wearing yellow robes, and you will occasionally receive a chat-box warning that he is calling out for help. If you can find him, he will require 10 of a certain kind of rune which you can either ask him about or right-click and select the "Best Rune" option. 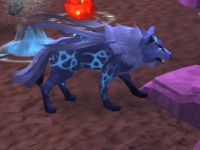 In exchange he will teach you a bit of what he has learned about the Runespan, granting a large sum of experience. You can exchange runes besides what he is looking for, but you will gain a bit more experience by handing in the required runes. If you are having trouble finding the Yellow Wizard, you can ask any of the other wandering wizards or Wizard Finix for help in finding him (The wandering wizards have a right-click "Find Wizard" option). They will point you in the right direction in the form of an arrow below your character and on the minimap which lasts for a short time. Every so often a Runesphere will spawn. 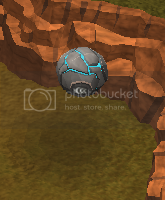 You will receive a chat-box warning that a Runesphere has spawned, and the Runesphere icon will appear in the top-left corner. You can then go and hunt it down. A Runesphere can have multiple layers you have to siphon off, such as a chaos layer, or an earth layer. While siphoning a Runesphere you convert your rune essence into runes (which runes you get depend on the type of layer), and you get some rune dust. Once all the layers of the Runesphere have been siphoned off, there is a core of Pure Energy left behind. You can hand in any rune dust you have acquired to gain experience, 1 rune dust being worth 10 experience. 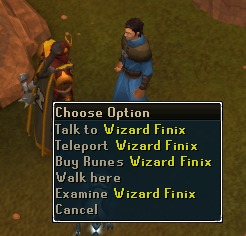 When you talk to Wizard Finix outside of the Runespan in the Wizards' Tower, you have the option to see his shop. This is where you can then spend the reward points you gain in the Runespan. He sells a few things related to Runecrafting and the Wicked Hood. Here you can purchase a full set of Wicked Robes. Each piece (besides the hood) requires a successively higher Runecrafting level to use, with the Cape at 30, the Robe bottom at 55 and the Robe top at 80. The cape offers -6kg of weight when worn, the robe bottoms offer -8kg, and the robe top offers -10kg. Also, for each piece of the Wicked Robe set you purchase, you will be given 25 extra essence in your Wicked Hood daily, and also given another teleport to selected altars. There are also Runic staves, with the mid- and high-level staves able to be aligned to cast a spell. Runes can be loaded into the staves for 1000 casts of various spells, and these will be used in place of runes in your inventory, saving space. There is also a chance runes won't be used alltogether. 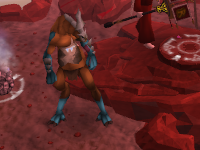 Finally there is a Massive Pouch which requires 90 Runecrafting and can carry 18 rune/pure essence. These pouches last 44 uses before crumbling to dust, so you must continually buy them from Finix. This tab is more to show off how much you have trained in the Runespan. 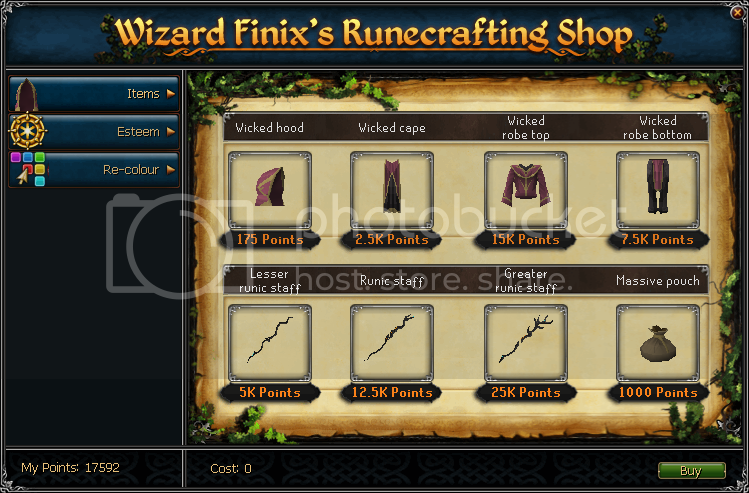 Each level purchased will display that levels icon on the Wicked Robes. Esteem rank 1 costs a whopping 211,860 reward points and is a requirement for the trimmed Completionist Cape. 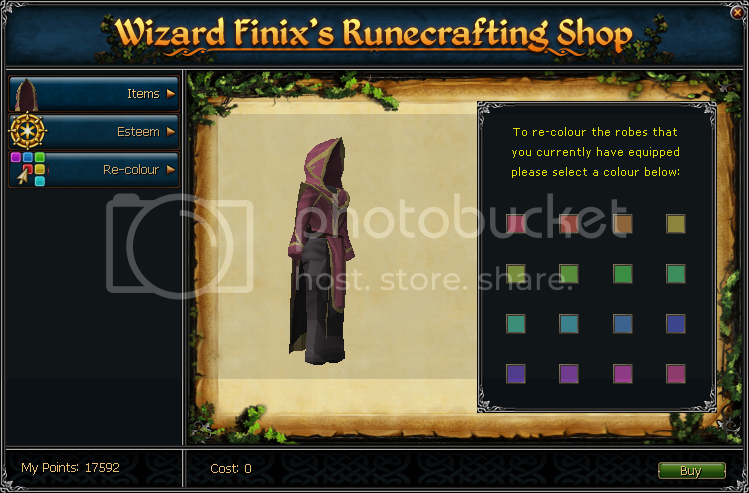 Here you can change the colour of any pieces of the Wicked Robe set that you currently have equipped. It's a good idea to equip your full set before re-colouring, or else you might find yourself spending more points than you'd like. That's the Runespan! A low attention, relatively fast (much faster than running runes, for sure) method of training your Runecrafting at no cost, and no profit, that can yield you some nice rewards.